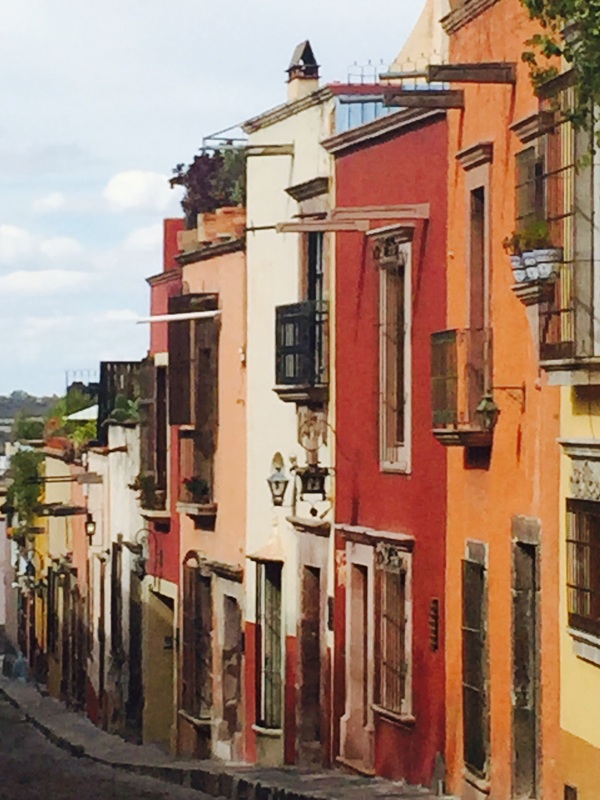 Going to San Miguel de Allende is a calling. The city has been tucked away in a cobblestoned corner of my imagination for twenty-five years. Mary Morris’s courageous chronicle, Nothing to Declare: Memoirs of a Woman Traveling Alone, put it there. Her soul-baring tale of living in San Miguel, 6,400 feet high in the Sierra Madre of central Mexico, captured my heart and gave me even more courage than I already had to travel alone. And now, I’m finally here, lucky girl that I am, on my own for a weeklong writer’s conference. The place is everything I’d pictured, painted in vivid, brilliant color: greens, and golds; mango, mustard, and lemon; and of course, every shade of red imaginable — burgundy, cayenne, paprika and raspberry. Ceramic pots filled white, purple, and blue blossoms set off the pueblo colors. 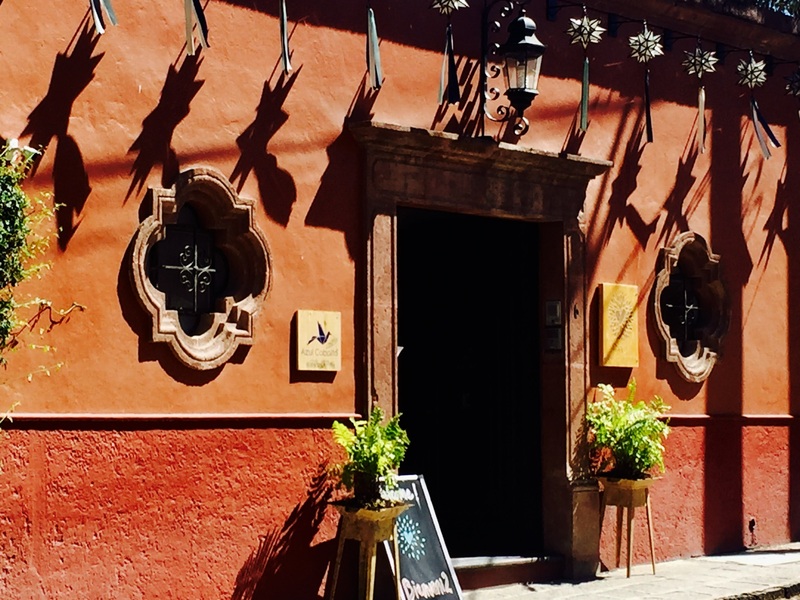 Brimming with boisterous gardens and with a temperate, year-round climate of brisk mornings, warm afternoons, and cool evenings, San Miguel is eternally spring. With more than 140,000 residents, it can certainly be labeled a city, but deeper down, at its heart, it’s a delightful, lively, village. There are many places in the world others consider lovely, but leave me feeling cold. San Miguel, on the other hand, embraced me the moment I arrived. I feel I belong here, with these people of my tribes. During the day, I commune with writers of every ilk — novelists, poets, essayists, playwrights, memoirists, and screenwriters. 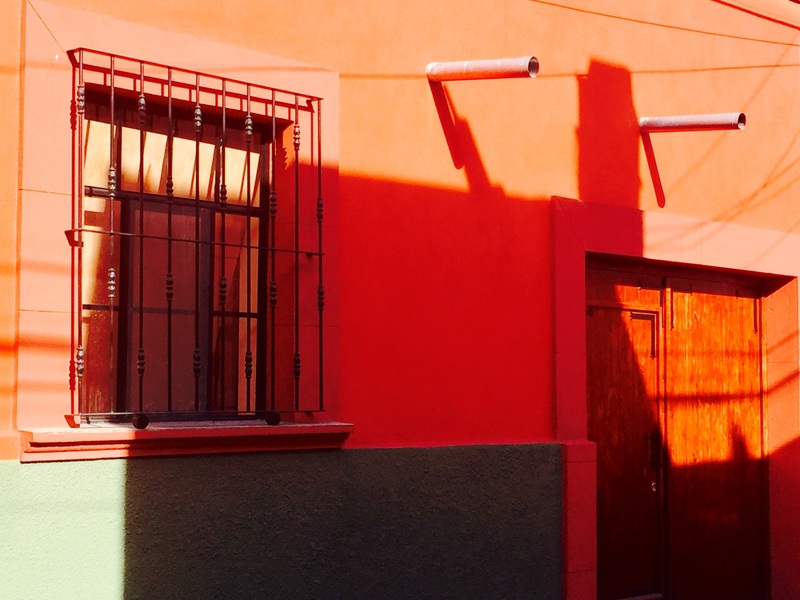 And when I escape into the long shadows and crystalline light of the late afternoon to wander narrow lanes between high, painted stucco walls and monumental wooden doorways, I’m at home among the locals. They look like my father and my grandfather before him. The men are short and the women shorter. Just like my Dad and just like me. I recognize my siblings’ body types in those of the flower vendors and musicians on the square in front of the Parroquia church. The features set in their silky brown complexions — heavy-lidded eyes and full lips — are the very same features that look back at me and my easily tanned white skin in the mirror. These people are my ancestors, those in the sepia picture of my grandfather’s 1906 First Communion, his mother and his sister beside him, multiple aunts and cousins in the background. Yes, indeed, I feel at home here. 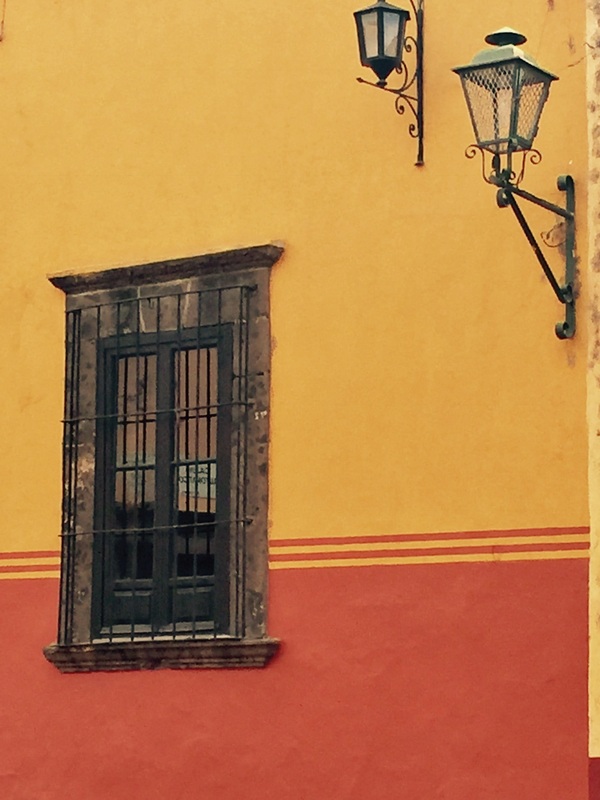 I stop for breakfast one morning on San Miguel’s central square. I choose a table in the shade, the breeze already warm. My mouth waters as a beautifully arranged platter of fresh fruit is set in front of me – mango, melon, banana, pineapple, and papaya, with a dollop of yogurt and a sprinkling of granola. The waiter could be my brother with his sturdy Cañedo silhouette. My years of Spanish classes serve me well as he and I chat, even though I admit: “Comprendo mucho, pero hablo solamente un poquito (I understand a lot but I speak only a little).” Fruit juice drips from my chin and my thoughts drift to a what-if of my family tree. What if my Mexican grandfather and my American father after him, hadn’t both married Irish women, Mae Duffy and Mary Darby? 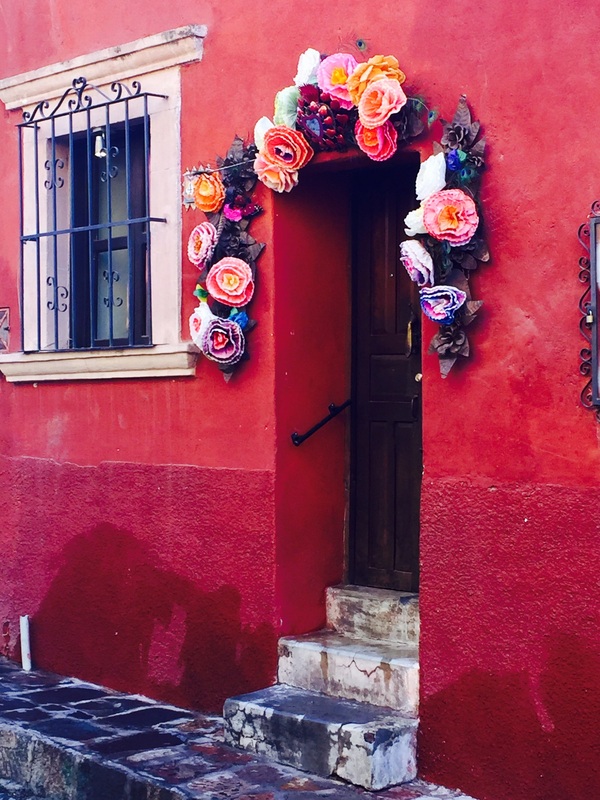 I would likely look just like her, this woman who passes by in a hot pink dress and turquoise apron — traditional dress worn to help sell the handmade dolls and woven flowers spilling from baskets looped over her arms. My long, dirty blond hair, while still long and straight, would be lustrous and dark, just like hers. Mi hermana mexicana. My new friend clears my empty plate and asks if I’d like more coffee. “No, gracias,” I answer and smile. 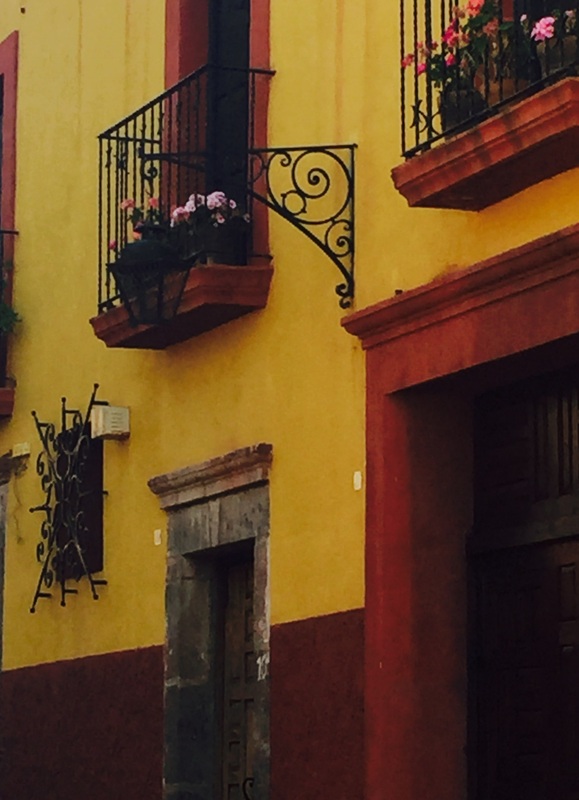 It’s time to get back to my second tribe – my writing tribe — but I’m reluctant to leave this comfortable spot where it’s so easy to watch the world of San Miguel pass by. I pay la cuenta and leave a tip worthy of family. “Hasta mañana?” he asks as I swing my bag over my shoulder. Will I see you tomorrow? “¡Claro que sí, señor, hasta mañana!” I step from behind my table, my crooked pinkie waving goodbye in the sunshine. So Glad you had a good time Madame! So happy you read it, Ethan. It was a wonderful. productive writing conference. 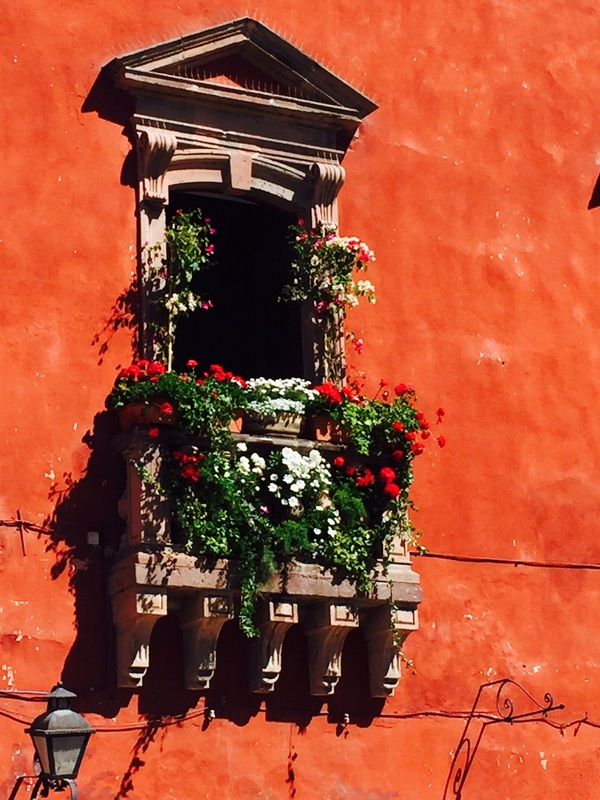 San Miguel de Allende is a bit like the Aix-en-Provence of Mexico! How are your plans going for suggesting France as your 16th birthday gift? I have better hopes for something else traveling wise. I’ll be going on a cruise to Mexico, Belize, and Honduras out of New Orleans with my grandparents that’s summer hopefully. We might try and go to Montréal that summer also so I can get a taste of that. Thanks for asking! Gorgeous pictures and story, Marianne. I would’ve never guessed that the little blonde I know has Mexican roots. It was fun spending time together at the writing conference. Best to you always! So much to learn about everyone, right? Hope you had a good homecoming, Leslie!